On October 12th, I had the opportunity to see Masuda Takahisa’s play 「フレンド -今夜此処での一と殷盛り-」two times at the Tokyo Globe Theater! The Tokyo Globe theater located at Shin-Okubo station, one stop away from Shinjuku going towards Ikebukuro station on the JR Yamanote Line. This is only the second time I have ever been to the Globe Theater, the first being for Shige’s play back in April “Naka no Hito” 「中の人」. The first showing of the play started at 1:00pm so my friend and I actually entered about 10 minutes before the first show started and I quickly bought goods and sat down. My seat was on the first floor, Row G on the right side when facing the stage. These seats weren’t bad for the first viewing because I felt like I was inside the play at the end (which I will get into later), even thought it was a bit low to the ground and me being small, sometimes seeing in-between other peoples’ heads in front of me wasn’t fun. Then the play started right at 1pm. Please note there are spoilers following this, so please be careful if you are going to see the play! The opening scene begins with Massu’s character helping a drunken person walk along, coming in from the right section of seats near the stage, then up the stage, and barging into a bar late at night when they are closed. Here you also meet the character that will become Massu’s character’s wife later on, Akiko. It then cuts to one of the characters explaining the setting of the play. 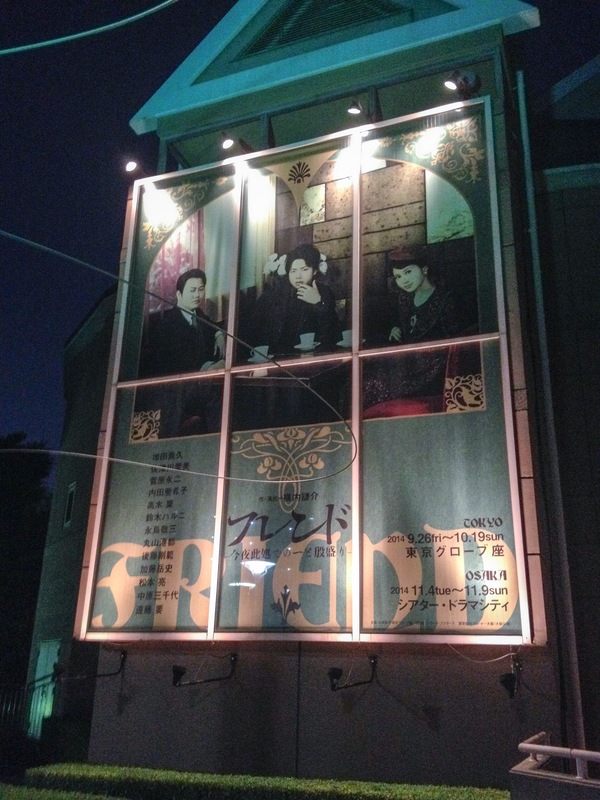 The setting is a bar/ Izakaya called “Friend” (in Katakana) located near Shibuya Station in Tokyo. He also introduces some of the characters as well and after this the play starts. The play takes place beginning in Showa Year 5 (1930) and continues through out the years until, I believe, probably between Showa year 17 or 20? (1942-1945) when the bombings of Tokyo happened. It is a “one room” setting play with only one set change towards the end of the play. This play is actually based on a true story of a famous Japanese poet named Nakahara Chuuya. He was a famous poet in the early Showa period. Massu’s character, Yasuhara, went to school together in Kyoto with him they are good friends. Nakahara is going through struggles many struggles, including love problems and problems with his attitude and not getting along with people well, which leads to many funny scenes in the play, but also some emotional ones as well. The play has many themes, including friendship, love, and loss. Through the play, Yasuhara evolves as he grows older and he has to choose giving up working with Nakahara on writing and literature and the arts, which he loves, for having a stable job for income because he gets married. This decision comes from the cover that he drew for the author’s book being rejected by the publisher (which he helped get published in the first place) and him getting married as well. This ends up being one of the most emotional scenes in the play because he is rejecting to continue being Nakahara’s “partner”, but explains that he will stay his friend no matter what. This also happens on the day that Yasuhara’s engagement is being official. Other emotional scenes include the girl working at the bar, Akiko (who ends up being Yasuhara’s wife character’s wife), accepting the offer of the owners of the bar to become their daughter, as well as sending off their friends to War and the scene when Yasuhara came back from the funeral of Nakahara. The play did a good job of blending in comedy with all of the emotional themes, which is why I called it an “emotional roller coaster” after I saw it for the first time. The funniest scene in the play for me was right after the really emotional scene of Akiko accepting the owner’s offer to become their daughter. At the beginning of this scene, Yasuhara is about to enter the bar, but stops when he sees the owners come down the stairs, so he quickly shuts the door and stands outside the bar listening to the whole conversation as it goes on. At the end of the scene, when Akiko accepts the offer to become their daughter, Yasuhara begins to bawl crying and everyone in the shop is confused to where it is coming from, and one of the other characters exits the shop and sees him crying and brings him inside. Massu was adorable and the way that he cried on the lamppost outside the shop was hilarious! I was laughing so hard after crying at the emotional scene before it. Yasuhara was a great combination of adorable and cheerful, but also surprisingly serious at certain points. The ending of the play was a huge emotional punch. The play had been pretty steady up until about ¾ of the way through. After that it, speed up once the war started until all of a sudden sirens begin to go off. These are sirens during war for when an air-raid bombing is about to begin to warn people to take shelter. Bombs “go off” and then you see Yasuhara stumble out from the back of the theater as the bombings are going on, all covered in soot and dirty and he is searching for his wife. This is the part that you feel like you are in the play, as the play actually moves into the seating area. Yasuhara trips and falls (passing out) then the bombings all of a sudden “stop”. From the right side of the theater, Nakahara’s “ghost” appears and begins talking to Yasuhara and leads him back to Friend, just as he normally used to back in the day. The only catch? Friend is on fire. So this scene is very powerful and eerie as everything is like normal with everyone dead and alive there, but the bar is on fire. The sound effects then stop after showing that it was a gathering of some sort, and everyone begins reciting some poetry together (possibly from Nakahara’s poetry?) and then all of a sudden Yasuhara begins to be pulled back into the “real world”, saying that he can’t die now, as he made a promise Akiko (his wife) when they got engaged that he wouldn’t die as all of her family died in a bad earthquake and she didn’t want to be left alone. Yasuhara gets pulled behind the curtain and the Nakahara recites more of the poetry and exits out the back of the theater. It then turns to Tokyo being in rubble and Yasuhara waking up at Friend in rubble as well. On the right side of the stage you see the figure of someone approach and they take their hood off as she notices Nakahara. It is Akiko and they are finally reunited after the bombings. They have an emotional reunion with her showing some important things that she saved that were important during the play, as well as saying that the owners of the bar are safe. The play ends with them hugging and crying there in the rubble of Friend. At both performances I was crying so hard at the end of the play that I still hadn’t stopped as the curtain call was going on. Massu’s acting was amazing and this play was such an emotional roller coaster. Tons of people were crying during this play, which really does show that the whole cast, not just Massu, did an amazing job. Even I, who still isn’t totally fluent in Japanese, was moved to tears. I wish that I could understand more of the poetry in this play, but poetry is difficult to understand in any language. There were also some romantic scenes between Yasuhara and Akiko that were cute as well! There wasn’t any kissing, just hugging, which actually made it even cuter I think. I also attended the second show that day and that one began at 6pm. I was in Row N towards the right side of the stage again and since it was elevated I had a very clear view of the stage and this was probably a better seat than the one I had at the first show because of that. I was also closer to where Massu entered a few times in the play. Thank you Massu for an amazing play! It was more than I could ever imagine! I hope that you all enjoyed this play report! I did my best to convey some highlights of the play without telling everything about it. Please leave any questions or comments down below. uwaaaaaaaaaaa~ I wish I could watch this too~ it sounds interesting. Thank you so much for the report. The stageplay sounds interesting and like it really pulls the audience into the story, and that is the best kinds of play. Yes! At the end it really did and I enjoyed it a lot. Hi! I would like to ask if you don’t mind. Ueda will be having a butai at Tokyo Globe Theater too and I was wondering was can you advise to me about ticket seat for that theater?